How to wear my black cigarette pants? Last week, I edited the closet of a client who owned several black cigarette pants and this gave me the idea to create a lookmaker about this timeless piece. Here is how you could rock those. First, make sure you have the right ones for you. Cigarette pants have a natural “business” attitude. 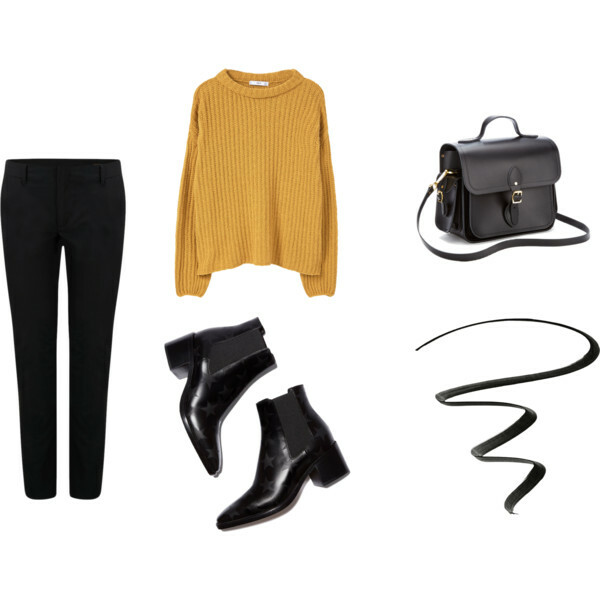 If your office is not too formal, you can break this style with a cosy knit and flat boots. Warm colors always work wonderfully with black. A Chanel like jacket can instantly make you look 10 years older. Even more if you match it with something as classic as black cigarette pants. I therefore recommend you to associate it with some boyish or rock shoes. The printed Coachellike T-shirt is optional ^^ plain black, white or grey would work too. Silk shirts are warmer than you think. They are classy, feminine and the perfect elegant choice for winter. With stilettos this is a great executive woman outfit. You could go for plain classic colors, but here I chose to make the look stand out with a fun print and a messy hairstyle. Pair them with a sophisticated top and sky-high heels for instance. Complete with a sultry smokey. And you? How do you wear your black cigarette pants? hi, i was wondering if you had any tips on how to style cigarette pants as a curvy lady. i adore the style but i worry that it emphasises my stomach too much and doesnt look right without a more boyish figure. What would you recommend to make it suit me a bit better? thank you!! Hum, that deserves a post maybe. I recommend to wear a fluid top that hides the stomach area and to go for a slightly elastic waist along with heels.